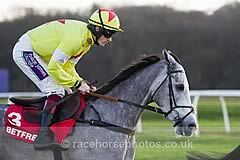 Politologue, an unfortunate loser at Aintree last season when stumbling a few strides after the last fence, looked like winning on the bridle at one stage. Having travelled and jumped with elan all the way, Politologue appeared to get very tired in the closing stages, giving his stablemate another chance after the last. However, San Twiston-Davies was able to keep the 5-2 favourite up to his work to win by two and a quarter lengths. Gino Trail, who led until the top of the home straight, stayed on to finish third, just ahead of Garde La Victoire. The disappointments of the race were top-weight Ar Mad and Forest Bihan, who never looked like getting involved at any stage and were both pulled up in the testing ground. Winning owner John Hales, fortunate enough to have seen Azertyuiop and the brilliant One Man race in his silks, said: "We thought we'd won it at Aintree. "I've never had a horse trip before. He landed perfectly then he tripped but today was perfection. "That was how to jump at speed. He settled well. The ground helped him to settle. I was delighted with his performance and I thought it was excellent. "I'm sure the Tingle Creek (Sandown) is where we will go. It will be some race. I won't say he will beat Altior but I think he will give him a good race." Nicholls said: "I thought he might just need it (the run) a fraction on that ground. "He had a gallop the other day and the other horse had had a run and, to be fair to San Benedeto, he has improved massively and he has run really well, too. "That was a good performance as he can only improve. Sam said he jumped brilliantly and travelled so well. "He got there almost too soon but we will head off to the Tingle Creek now. "Last year I got in my mind we were doing the wrong thing with him and not using his jumping, which is his best asset. "He probably is a really good two-miler, which he has proved today, and we have obviously got to go down the route of the Tingle Creek and hope it is soft." Nicholls went on: "They were so far in front of the rest, he was probably just getting a bit tired and lonely. He was idling a little in front. "Last year in those novices, because of his jumping ability, he couldn't help going off in front and that is why we put the hood on near the end. "In the better races like this when they were going to go quicker, he was always going to settle and it was going to be better for him. Even though he was keen over the first bit, he's learnt to settle and he has that bit of class. "He is the same model as Master Minded. He is that type of horse and has got that speed. Master Minded was brilliant but I'm not saying he is him. "San Benedeto could run in the Tingle Creek, but there is a £100,000 handicap at Ascot at the end of November and he will probably go there and Bryony's (Frost) 5lb claim will come in handy on him. He will win a real nice race somewhere."